Dr Elmanharawy will tell you if you need bone augmentation. Bone grafting is a safe and highly successful procedure that involves the “building up” or adding bone to the jaw by using your own natural bone from another location and/or by using donor, processed or synthetic bone materials. Often the new bone can be obtained from inside the mouth. Ask your dental implant dentist about the advantages of different bone grafting methods and materials so that, together, you can make an informed decision. 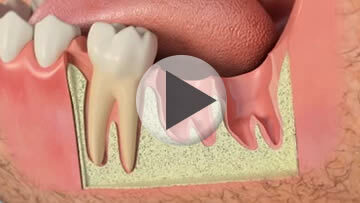 Bone grafts are often performed in the implant dentist’s office using local anesthesia to numb the areas that will be involved, sometimes along with intravenous sedation to remove anxiety. For those who would prefer an easier, but slightly slower solution, there are other sources of bone specially prepared to make them safe for use in humans. All of these materials including your own bone, simply provide a scaffold into which new bone will grow and consolidate ready to receive dental implants a few months later. 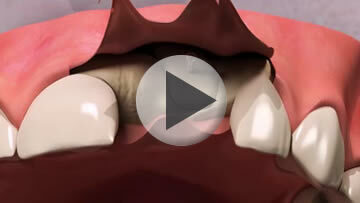 New bone can take anything from 3 to 12 months before it is ready to receive dental implants. Do not be in a hurry to move to the next stage. If you need a large volume of bone it will take longer to mature than a small amount. Guided tissue regeneration - Each surgeon will have his or her preferred way of creating new bone. Many of them will also use a supplementary technique called ‘guided tissue regeneration’. Using this technique slow moving bone cells are given time to fill a space by placing a barrier material between them and the fast moving cells of the soft tissues lining the mouth. When this technique was originally developed the barrier material had to be removed during a separate surgical stage a few months later. Whilst these original materials are still in use, it is now more common to use a ‘resorbable barrier’ that will disappear naturally a few months after it has done its work. 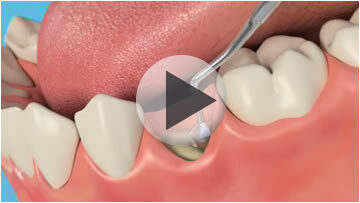 Once a tooth is lost, the bone and gum will begin to recede. 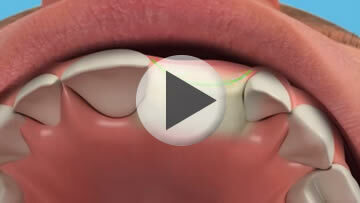 If you later decide to have an Implant fitted this bone recession may mean that the Implant would sit too high or the Crown would sit too low for your 'bite'. 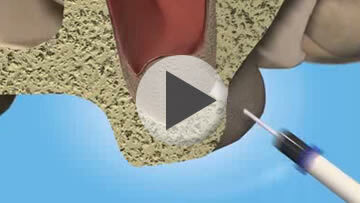 A material can be inserted into the cavity to encourage bone re-growth. Over time, this will provide a sufficient amount of bone to support the Implant.